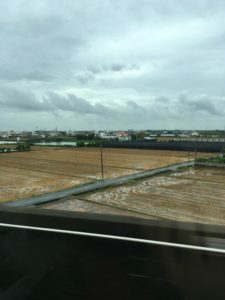 Riding on a train through southern Taiwan, the main source of rice and whole grains. Grains and rice are principal food for more than half of the population on this planet. 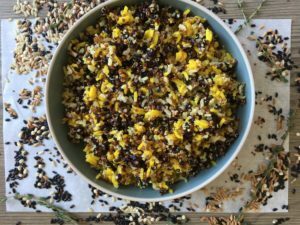 Grains and rice have been a source of energy and documented in many traditions for thousands of years. Whole grains and rice are also prized for their multiple health benefit to humans. More importantly, whole grains have great textures if cooked right. I promise to bring you the pleasure of eating and cooking grains if you could follow few simple guidelines. Wash or rinse your grains and rice: unless you are making porridge or congee, or toasting grains with fat initially, washing your grains gets rid of the excess of starch on the surface to avoid clumping and turning the final product into a mush. Wash grains with cold water until the water becomes clear. Having grains in contact with water also softens the surface and allows better liquid absorption in cooking. 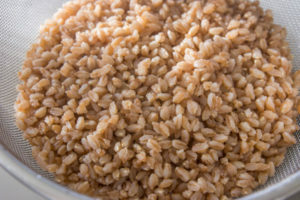 Ratio: the ratio of water to hearty grains, such as barley, wheat berries, or farro, is 4 to 1, in volume (soaking grains overnight could reduce the ratio to as little as 2:1). Brown rice has the ratio of 2.5 to 1, in volume. Long grain white rice has the ratio of 1.75 to 1, in volume. Short grain white rice has the ratio of 1.25 to 1, in volume as well. Note: these ratios could also vary by few tablespoons of liquid depending on your choice of pot; you’d like to choose a pot where raw grains only takes up one-third of the space of the pot. Cook them nice and slow: besides proper ratio of liquid to grains, which is discussed above, the single most important cooking technique involved is your patience. You must bring your water to a boil and maintain a steady simmer, and trust the process. If the cooking procedures are rushed, your grains will be undercooked, or overcooked as you try to rectify mistakes by adding more liquid. If you have a rice cooker, the robot will do the work for you. However, I find cooking grains over my stove top to be rather satisfying. Not only have I truly understood how grains absorb the liquid, but I have also noticed the subtleties in texture if I were to change the recipes. Keep the lid on, for 10 more minutes: steam generated by heat is crucial to the final stage of grain cookery. When liquid is completely absorbed by the grains, steam coming out of each kernel will further cook the grains and help you achieve the right consistency. Rushing to lift the lid and let out the steam often lead to slightly undercooked grains. Wash or rinse your grains or rice, choose the right pot and ratio, cook the grains or rice nice and slow, and keep the lid on for 10 more minutes at the final stage, you will have a bowl, or many bowls for that matter, of pleasantly cooked grains that are toothsome and delicious. Let’s talk about recipes, shall we? 2. Season the rice with salt, and add water to cover. Bring the pot to a boil and turn down to simmer. generally clear when washing brown rice, but do it anyway and trust the process). 1. 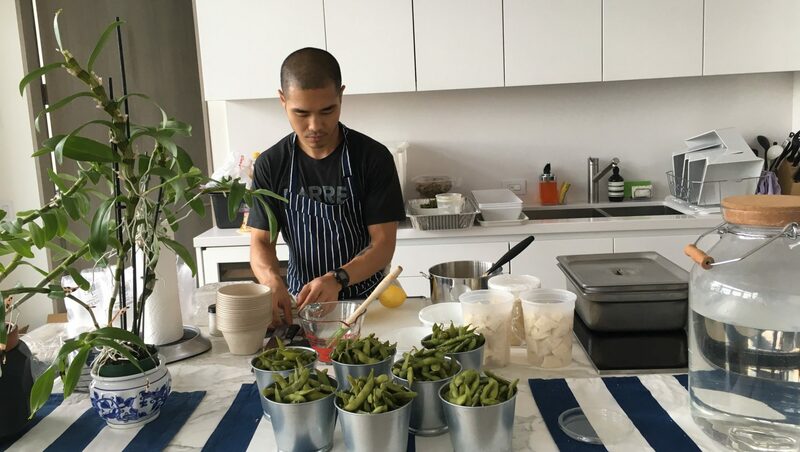 Rinse farro with cold water until it becomes clear (water is generally clear when rinsing farro, but do it anyway and trust the process). 2. Season the grains with salt, and add water to cover. Bring the pot to a boil and turn down to simmer. and it’s neither a cereal nor a grain! 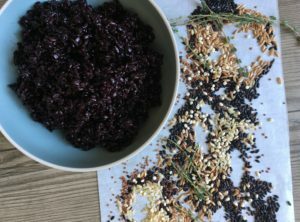 Red Quinoa is a seed, but cooks like grains, and is a relative to spinach, beets, and chard. 1. 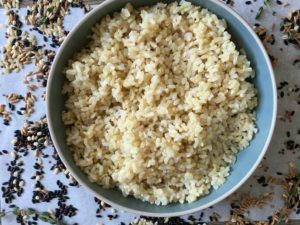 No need to rinse quinoa with water. 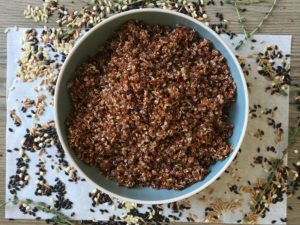 Cover red quinoa in a pot with water and season with salt. 2. Bring the pot to a boil and turn down to simmer. Last but not least, once you have mastered cooking grains, rice, and seeds, you may take the liberty and mix the final products together. Not only will you end up with a bowl of beautifully cooked whole grains, but you will also get to experience the nuance in texture. Good luck!